The video was made public, then disappeared, then returned. Lest the video permanently disappear, I decided to transcribe the entire video so that the content is preserved. Plus it makes for some eyebrow-raising reading. The primary message is that unions are out to make a buck, and that working at Walmart is ideal because all one must do to resolve any issue is speak to a leader. End of story. But those unions just won’t go away. And even though signing that union card is each individual employee’s right, you might ruin Walmart Utopia for other employees if you do. So, you could sign– but don’t. 50ish Black Male Associate: …Your signature on an authorization card or petition is actually a legal document that can be used to bring in a union. If a union gets enough signatures, you may never even have a chance to vote. What your signature really means is that you give the union the right to act for you and make decisions for you on workplace issues whether you agree with them or not. And once you give them your signature, you may never be able to get it back if you change your mind. 20ish White Female Associate: It’s hard to think that one little signature can be so important, but in today’s world, your signature means a lot. To be honest, I don’t like handing my signature over to anyone, much less to unions who seem to be spending so much time trying to hurt my company. My signature is too valuable for that, and so is yours. [The three other “associates” who spoke join in full screen, smiling as 20ish white female associate continues to speak] We’ve got a good thing going here: Great benefits, job security, career opportunities. It’s important to remember: Signing a union card isn’t just about you. You could also be affecting people who have worked here for years and enjoy Walmart for the same reasons we do. 20ish White Male: People like me. 20ish Black Female: And me. 50ish Black Male: And me. 20ish White Female: We’ve all found a home with Walmart, and we’re glad that you’ve joined the team. Good luck with your new career, and we hope that you never have to deal with a union organizing drive in your facility. But if you do, we hope that this video has given you the information you needed to stay in control of your valuable signature and your career. Yep. Life at Walmart is Perfect As Is. One week after I wrote the above post, on December 10, 2014, a National Labor Relations Board judge ruled that Walmart threatened employees for trying to unionize. (Reuters) – An administrative law judge found Walmart threatened employees trying to organize workers at two stores in California, in a victory for workers’ rights groups challenging labor practices at the retail giant. The ruling issued on Tuesday stems from complaints raised by workers at Walmart stores in Placerville and Richmond, California, arguing they were unfairly disciplined for trying to organize employees. Complaints about labor practices at stores around the country have been consolidated into a nationwide complaint that is ongoing. According to Forbes, the Waltons are the richest family in America, worth $149 billion in 2015. The source of their wealth is Walmart. The Walton family has ironclad control over the world’s largest retailer: Together, six of the Waltons own nearly 54% of the shares. Rob Walton stepped down in June as chairman of the company, a position he held for 23 years. His son-in-law Greg Penner succeeded him. Though often embroiled in controversy — Mexican bribery scandals and criticisms over employee pay have grabbed headlines over the past year — Walmart’s sales haven’t suffered: it generated $486 billion in revenue in fiscal year 2015 . Squelching union activity serves the billionaire Walton family. As a result, the Waltons save money, and the Waltons live better. Please stick with Common Core issues. I just read an article by Drew Franklin, in Popular Resistance, “TFA Embedded In Black Lives Matter”. The Waltons don’t just “stick” with discount retailing. Their influence is pervasive from cabinet appointments, in Pres. Obama’s administration, to TFA, and beyond. Thanks to Mercedes Schneider for exposing their threat, from all directions. Huh? 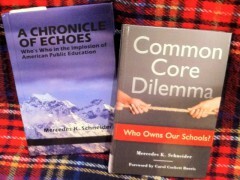 Mercedes teaches high school English full-time and writes an indispensible and meticulous blog detailing the malfeasance of the privatizers of our public schools and their misuse of statitisics and data. What qualifies you to tell her what to write about? Walmarts have destroyed small town America. I avoid the place like the plague…but I wonder for how long? If people keep patronizing this business, how long will the other places be able to remain open? Don’t people think about this when they shop there? Every town looks alike now because the independents have been put out of business. And I don’t get the thought you can save money there — when I’ve had to go there because of no other option, I haven’t seen a great price difference between them and the chain grocery store I patronize. And the quality is not there, either. Send your money to China, folks! Another fantastic report, Mercedes. Thanks. Would never have seen this any other way….so please continue to keep us informed on all things that affect our society. As you know, I teach public policy and appreciate your always valid information. BTW…was in a Salvation Army store recently, and they were using Walmart shopping bags. What is that about? Happy Holidays….you are a treasure. This attempt to make the false equivalency between the Walmart Corporations and “unions are multi-million-dollar corporations, too” is nonsense. How many CEO’s have the following career trajectory and salary? John Perez was from making $60,000/year as a classroom teacher, then after winning a democratic election, took a temporary release from teaching to serve as the United Teachers Los Angeles President, where he then made $80,000/ year (no officer, including the UTLA president can make a salary higher than the highest-paid UTLA teacher. After serving for three years, (2002-2005), he returned to the classroom and his $60,000/year job teaching kids. A.J. Duffy was making $70,000/year as a classroom teacher at Palms Middle School, then after winning a democratic election, took a temporary release from his teaching job to serve as United Teachers Los Angeles president, where he then made $80,000/year for the six years (2 3-year terms) that he served as president. After serving for those six years (2005-2011), he returned to his classroom at Palms Middle School and his $60,000/year job teaching kids. Warren Fletcher was making $70,000/year as a classroom teacher at City of Angels High School, then after winning a democratic election, took a temporary release from his teaching job to serve as United Teachers Los Angeles president, where he then made $90,000/year as union president. After serving three years (2011-2014), he returned to his classroom at City of Angels High School and his $70,000/year job teaching kids. Current UTLA President Alex Caputo-Pearl was making $70,000/year as a classroom teacher at Crenshaw High School, then, after winning a democratic election, is currently taking a temporary release fro his teaching job to serve as UTLA president, where he’s making about $90,000. Alex will likely return to his $70,000 job teaching kids. In all those instances, they went from serving as a teacher on June 30th —cleaning out their rooms, then putting all their materials in storage for their eventual return to teaching—- to getting sworn in as president and commencing their service on July 1st. What multi-million-dollar corporation operates like this? Not Walmart. Oh, and one more thing.